The primary goal of ScalaSTM’s reference implementation is to implement all of the features of the ScalaSTM API in pure Scala. It aims to be as efficient for the general case while being robust to performance pathologies (highly contended data, lots of threads, huge transactions, …). use a simple but complete contention management strategy. ScalaSTM is a bit slower than tricky locks when there is only one thread, but it scales better. STMBench7 1’2 is an STM benchmark that performs a mix of reads, writes, bulk reads, and bulk writes over an in-memory representation of a CAD model. Versions are available for C** and for Java. For comparison purposes the benchmark comes with two locking strategies: coarse and medium. The medium-grained locking implementation is representative of the approach that an experienced parallel programmer might take (it is complicated enough that early versions of the benchmark had concurrency bugs). Rather than trying to compare the performance of one STM to another, this experiment will compare ScalaSTM to simple (coarse) and complex (medium) hand-rolled locking strategies. Let’s start with the read-dominated workload, which should benefit most from the STM’s optimistic locking. The test machine has 8 real cores plus Hyper-Threading, so it can run 16 threads at once. 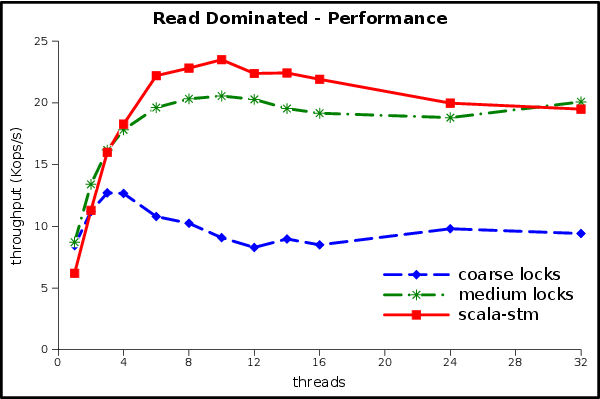 We also tested at higher thread counts to verify the robustness of the contention management in scala-stm. This result is excellent! STM has the same implementation complexity as the coarse-grained lock (one big reader/writer lock), but it has much better scalability. The single-thread overhead of STM is overcome even at 2 threads. Despite being much more complicated (which means expensive to write, test, and maintain) the medium-grained locks have a lower peak performance than the simple STM code. The write-dominated workload won’t be as rosy, because there is not much scalability to be found. Note the change in the units of the Y axis. None of the implementations scale in this experiment. There is too much writing for readers to get a benefit from optimistic concurrency or reader/writer locks, and the writers touch the same data so often that any benefits from parallelism are lost to cache misses and synchronization overheads. The STM can’t use scalability to compensate for its single-thread overheads, but at least it is handling the contention without any performance pathologies and with relatively low overheads. The read+write mixed workload should be better than the write-dominated workload. At first glance this looks more like the write-dominated performance than the read-dominated one. Did something go wrong? This graph shows the real-world effects of Amdahl’s law. We can think of the write-dominated component as the sequential part, since it doesn’t benefit from parallelism, and the read-dominated component as the parallel part, since it gets faster when we add threads. 50% of the work isn’t scalable, so we will be limited to a speedup of 2. Even if reads were completely free the mixed workload’s ops/sec would only be double the write-dominated workload’s ops/sec. We can estimate sec/op of the mix by average the sec/op of the two component workloads (throughput is op/sec). Armed with this formula we see that the mixed workload’s performance is exactly as would be expected from the previous two experiments. 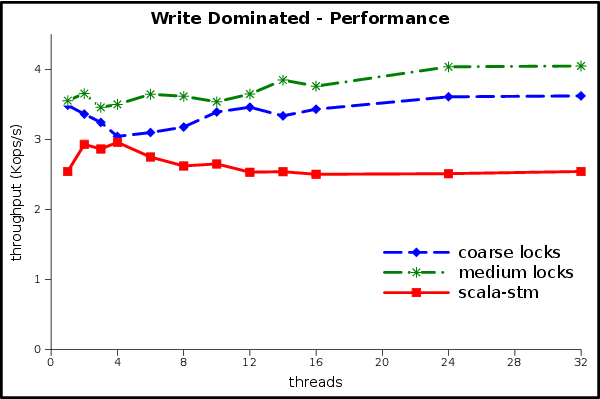 copying performed during updates to the immutable.TreeSet, TSet and TMap used by the Scala version of the benchmark. How much extra garbage is actually being generated? This graph shows an estimate of the steady-state reclamation performed by the GC during the benchmark, in gigabytes per second. The peak GC throughput is 3 times higher for STM than for the medium-grained lock implementation. That’s a pretty big relative increase, but is the absolute value of the numbers big or small? Here we see the percentage of wall time taken by the GC. The ScalaSTM implementation spends up to 9% of its execution time in the GC, compared to 3% for the locking implementations. The benchmark represents a worst-case scenario in which all threads spend all of their time in transactions, so although there is an opportunity for further tuning here it will only yield an incremental improvement. 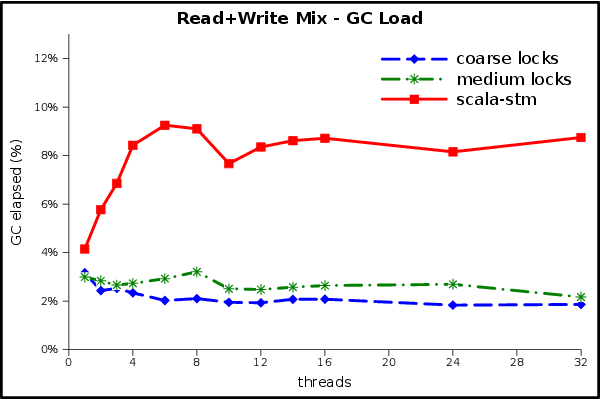 More GC graphs: read dominated rate, load; write dominated rate, load. Experiments were run on a Dell Precision T7500n with two quad-core 2.66Ghz Intel Xeon X5550 processors, and 24GB of RAM. We used the Linux kernel version 2.6.28-18-server. Hyper-Threading was enabled, yielding a total of 16 hardware thread contexts. Code was compiled with Scala version 2.9.0-1. We ran our experiments in Sun’s Java SE Runtime Environment, build 1.7.0-b147, using the HotSpot 64-Bit Server VM with default options. We used STMBench7 for Java version 1.2 (25.02.2011), disabled long traversals, and did not count operations in which OperationFailedException was thrown (this is the configuration used previously by STM researchers). Each data point is the average of 5 executions of the benchmark, each of which lasted for 60 seconds. The ScalaSTM API, reference implementation and STMBench7 adapter were compiled using git version 33ebff7560855552f387d0618ddef208aa4b9191 of the source. If you’re interested in digging deeper you can find implementations of the mutable STMBench7 data model in the scala-stm source code at src/test/scala/stmbench7/scalastm, and you can find the raw results and the spreadsheet that produced these graphs in the stmbench7_exp git branch. You might also try adding -Dccstm.stats=true to gather statistics about commit and rollback rates, read and write set sizes, and more. 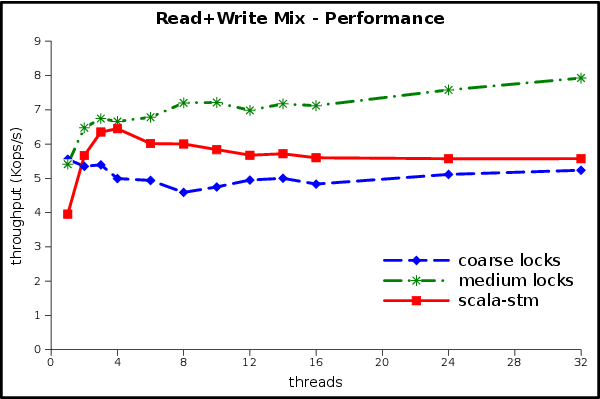 This set of experiments shows that the reference implementation of ScalaSTM can deliver good and robust performance in a system with lots of synchronization. Our baseline was a carefully crafted lock implementation that is substantially more complicated and subtle than the STM version of the benchmark. 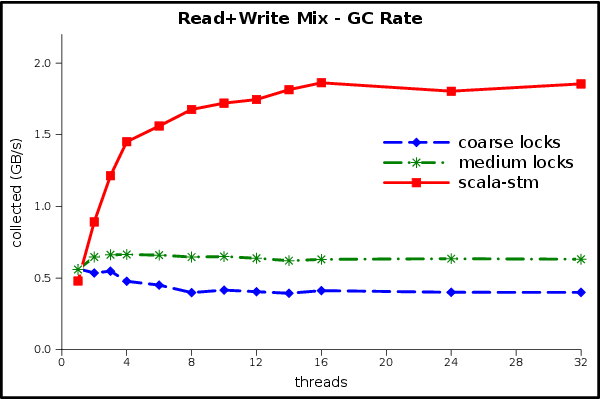 The STM version generated several times more work for the garbage collector, but still spent less than 9% of time in the GC. ScalaSTM implementations that take advantage of more aggressive techniques (such as bytecode rewriting) will be able to deliver even better performance than the reference implementation, while still delivering the same simplicity and composability advantages.